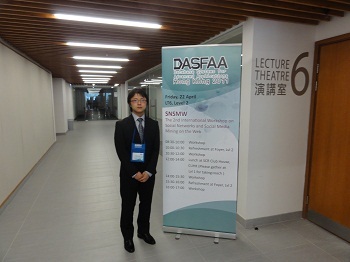 Jun Huang (黄 俊) presented his paper at 2nd Int. Workshop on Social Networks and Social Media Mining on the Web (SNSMW), colocated with DASFAA2011 Conference in Hong Kong, April 2011. His paper title is: Realtime Social Sensing of Support Rate for Microblogging. This page contains a single entry by webadmin published on June 15, 2011 7:42 PM. APWeb2011@Beijing was the previous entry in this blog. SocInfo 2011 is the next entry in this blog.